After 45 minutes of prepping, sale cooking and plating I discovered that I’d left my camera at work. And every other camera in the house was busted, adiposity so I had to use my phone’s camera. What a hideously unappetizing photo. But, food the food was too good to not post the recipe. One day when I have my camera, I’ll get around to making it again and will replace the grainy picture you see today. I’ve been toying with the idea of lettuce wraps for a long time. At first, I was thinking of onions, cilantro, beans and lime for Mexican/taco twist, but I wasn’t really inspired. Instead, I went with the more traditional Asian inspiration. Lettuce, pickled vegetables and some protein. They would have been tasty just like that, but I find that I have no energy for my 6am workout if I skip the carbs the night before. Would I add brown rice? Quinoa? Farro? They all seemed too heavy for the delicate lettuce. But bulgur seemed just right. For the protein, I couldn’t decide between steak and tofu, so I used both. I marinated them (separately) in tamarind juice, shoyu, chipotle pepper and garlic cloves for a salty sweet flavor. The steak and tofu were a match made in heaven and their slight sweetness complimented the acidity in the salad. Overall, it was exactly what I wanted. Full of flavors and textures, but still light and refreshing. And that bulgur powered me through a tough pre-dawn workout, so I’m sold! To make this vegetarian, simply omit the steak and halve the marinade ingredients. In a small bowl, mix the tamarind nectar, shoyu, chipotle pepper and cane sugar and then divide the liquid into two small tupperware (or 2 freezer-grade gallon-sized plastic baggies, if you prefer). Add 2 garlic cloves to each and then place the steak in one and the tofu in another. Cover each of them with their lid and give them a good shake. Marinate for at least 2 hours, but preferably 12 hours or overnight. I like to start marinating before breakfast for something I’ll be making for dinner. Preheat your oven’s broiler (500° if you can control it) then cook the bulgur. One of my favorite time-saving tricks is to fill a medium-sized microwave-safe bowl with water and nuking it until it’s almost boiling. Place the bulger in a fine mesh sieve and then drop it into the hot water for about 15 minutes. Once it’s ready, simply pull the sieve out and press the bulgur to get rid of any excess water. In a medium bowl, combine the bulgur, carrots, cucumbers, scallion, basil and mint. Make the dressing by whisking together the sesame oil, rice vinegar, shoyu, honey, lime juice and fish sauce, then pour it over the bulgur. Give everything a good mix and set aside or in the fridge for 20 minutes while you make the steak and tofu. Line a cookie sheet with foil (you don’t want to skip this step or you’ll have quite the mess on your hands after dinner) and place the steak on it. Broil each side for 10 minutes. You want to make sure to cook it all the way through because medium or rare skirt steak is almost impossible to chew. It’s done when it’s slightly charred on both sides and a knife can cut through it with relative ease. Once it’s done, remove it to a cutting board and slice it with the grain of the meat. While the steak is broiling, heat a large skillet over medium-high and lightly oil it. Once it’s hot, place the tofu on it, allowing each piece some room to breathe. Cook undisturbed for 5 minutes on each side. It’s important not to move them around too much or they won’t develop that nice, crisp edge. Once they’re done, slice them into pieces that are about the same thickness as you sliced the steak. 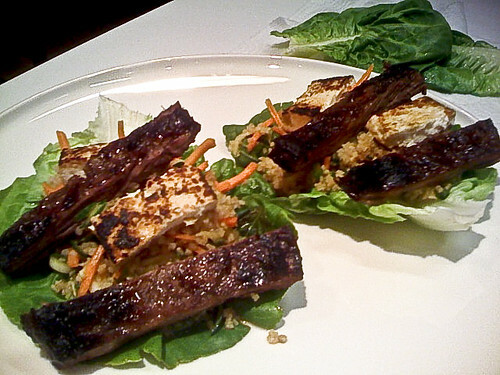 Finally, assemble the lettuce wraps by stacking a lettuce leaf, bulgur salad, steak and tofu. Eat like you would a taco, but keep a few napkins and a fork around so you can scoop up any stragglers.